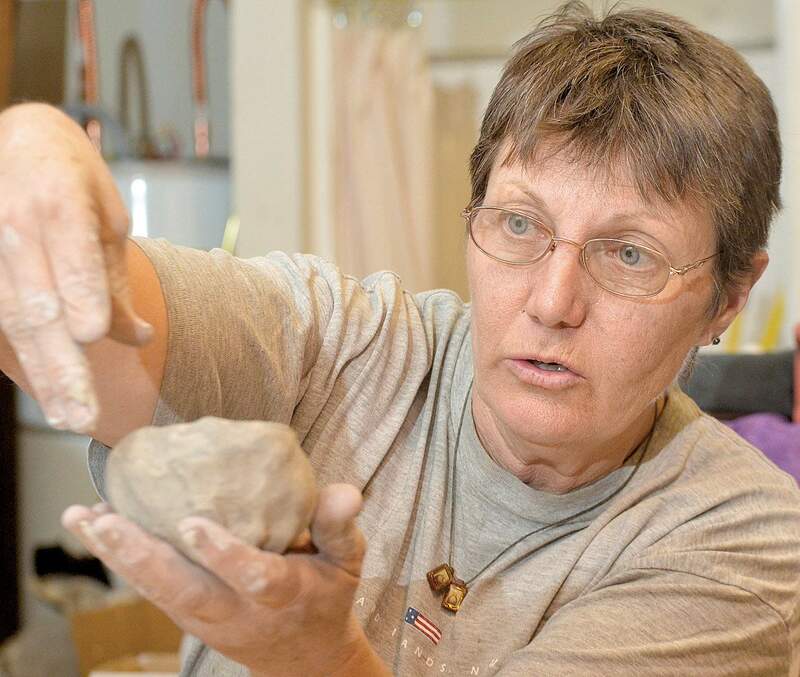 Kasey Correia teaches a pottery class at the Dancing Spirit Community Arts Center in Ignacio. The 26 artists who use the center see it as a way to boost downtown Ignacios economy. 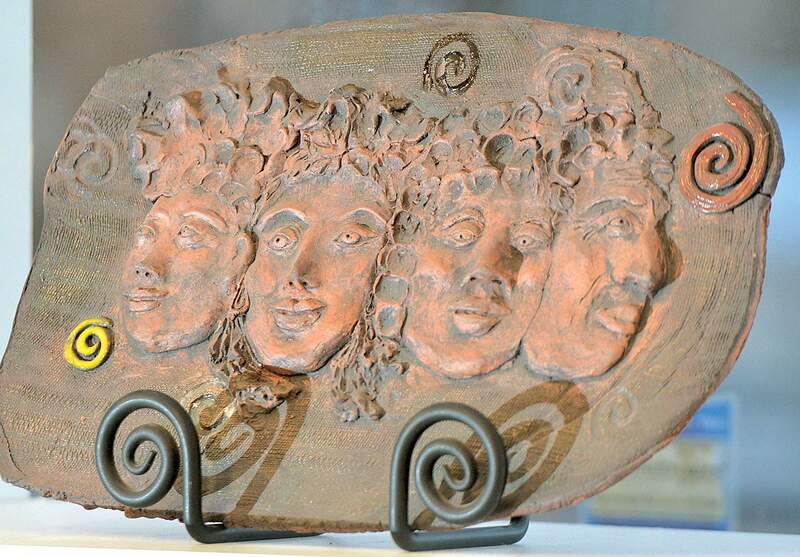 A clay relief by Margie Coates on display at The Dancing Spirit Community Arts Center,755 Goddard Ave. in Ignacio. The Dancing Spirit Community Arts Center, 755 Goddard Avenue in Ignacio, is a venue for the performing arts, and provides art classes, working studios, and a gallery where local artists can display and sell their work. The bland stucco walls of Dancing Spirit Community Arts Center are a stark contrast to the menagerie of artistic creations just inside the doors. Fused glass pieces, knitted scarves, brightly colored jewelry and dozens of paintings crowd the centers sunlit gallery space. Behind the gallery, a teaching studio shares space with a performance stage and central meeting area. The 3-year-old art center on Ignacios Goddard Avenue moved into this new 5,000-square-foot home this summer after growing out of two spaces down the street. With the move, the group of about 30 artists and supporters who have shepherded the venture sees an array of possibilities for the center to expand its role in the community. They see it as a way to connect the towns three cultures, boost economic vitality downtown, support local artists, and spread the power and beauty of art to local residents. Dancing Spirit started in April 2010 with 13 member artists and has since grown to 26 artists and a five-member board of directors, said Kasey Correia, president of the community arts center, which was incorporated as a Colorado nonprofit in 2011 and is applying to become a 501(c)(3) nonprofit organization. Unlike most other galleries, Dancing Spirit doesnt charge a commission on pieces sold from its gallery and charges member artists a $40 monthly rental fee, making it affordable for artists who wouldnt otherwise be able to show their work, said Ron Shermacher, an Arboles artist. But the art centers members see Dancing Spirits ability to promote economic development rippling beyond its support of artists. The hope is to help improve the entire town through art. The arts have gained more and more traction as a driver for economic development. The state of Colorado latched onto the concept three years ago when state legislators voted to change the Colorado Council on the Arts to Colorado Creative Industries under the Office of Economic Development and International Trade. The change was entirely out of the recognition of arts, culture and the creative industries as an economic driver for the state, said Elaine Mariner, the cultural director for the town of Parker and former director of Colorado Creative Industries. Last year, Durango nailed down the numbers on how much the arts add to the community. According to the 2012 study, nonprofit arts and culture organizations in the Durango area generate $9 million in annual economic activity. Artists help create a vibrant neighborhood that draws other people and businesses, Mariner said. By becoming a creative hub, you attract other creatives, she said. In Ignacio, efforts to promote economic development and revitalize downtown have started and stopped through the years. In February 2009, the nonprofit Downtown Colorado Inc. rounded up a committee of local and state economic-development experts to brainstorm ways to boost the towns economic activity and awarded Ignacio the Downtown Revitalization Award for its size in 2010. The town has started work on some improvements such as downtown design plans and an Ignacio Area Corridor Access Plan, but has been limited by money, Correia said. The economic downturn has also hampered efforts of a downtown revitalization committee. The committee began about four years ago, and one of its successes was convincing the Town Council to name downtown Ignacio a creative district last year. 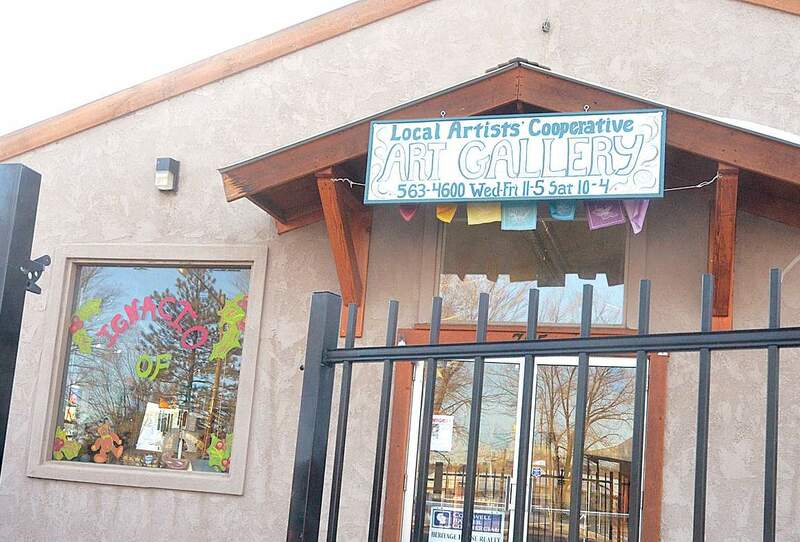 Correia and others in town say the community arts center could spur economic activity in Ignacio by attracting tourists and promoting the purchase of local art. The center can become another draw for visitors from the Sky Ute Casino or the Southern Ute Cultural Center and Museum, bringing them farther into downtown, community members said. It brings a nice balance to what this town already provides, said Emily Meisner, president of the Ignacio Chamber of Commerce. Shermacher, who guides river tours, said he could envision groups stopping by the arts center on their way to rafting trips. Rather than trying to replicate what is happening in nearby Durango, Dancing Spirits art gallery highlights the towns unique identity, said Anne Kernan, a volunteer grant writer for Dancing Spirit who is active in downtown revitalization efforts. Much of the art displayed at Dancing Spirit reflects Ignacios rural atmosphere and highlights unique elements such as alpaca farming, said Kernan, who takes classes at the centers studio. The center also puts a major focus on education  an important aspect of not only economic development, but also community development. Last year, six artists helped teach a class for home-schooled students at Pine River Community Learning Center and Correia is currently teaching an after-school art class for Ignacio students that is funded through the Southern Ute Community Action Programs. The center hopes gaining 501(c)(3) nonprofit status will help to apply for grant money to host more classes, including students in Ignacio School District, Correia said. Dancing Spirit members also see the arts cooperative as one more way to bring the Hispanic, Native American and Anglo cultures together. The center hosts fundraisers and arts shows that help promote a sense of community while artists promote diversity with their different forms of creativity, Kernan and Dancing Spirit founding member Meg McDonald said. In such a diverse community, art is a perfect center to downtown because it celebrates different cultures, talents, values and traditions, they said. It helps tie people together more, McDonald said.